Our patch was designed, created, and officially approved in the latter half of 2006, during Lt Col Gore’s tenure as squadron commander for the 115th Composite Squadron. His support and encouragement were instrumental in obtaining approval for this patch by Wing and National at the time. Capt Annie Formanek was asked by Lt Col Gore to design the patch as part of a Wing initiative under Col Reggie Chitwood’s tenure aimed at encouraging all squadrons within the Arkansas Wing to create distinctive patches for their units. The patch is a combination of both CAP’s Mission and our squadron name / mascot. Our unofficial mascot for the previous two years prior to this initiative or so had been the Flying Tigers, in honor of a World War II veteran guest speaker, but Hot Springs officially claimed that mascot in 2002 before we could. 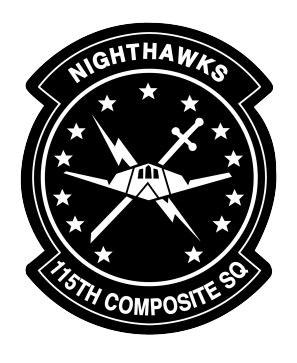 We don’t have much information on how we came about selecting “Nighthawks” as our mascot name. 13 Stars – Stands for 13 colonies. The current patch that we are using today was approved by Col Alexander in December 2012 after updates were made to include “Composite” in the name at the bottom of the patch. We also had the patch digitize at this time so that we could use it on other media as needed.